After going to see the inspiring Chris Ofili exhibition at the Tate Britian I popped over to my favourite cafe Sacred, just off Carnaby Street to have a Chai Latte and to meet up with a good friend. The intensely sweet and spicy chai inspired me to make a tray of Chelsea Buns, sticky and gooey, perfect food for this wet and snowy weather. Very similar to it’s American counterpart, the cinnamon roll, the Chelsea Bun lies its origins in the 18th century London Borough of the same name. 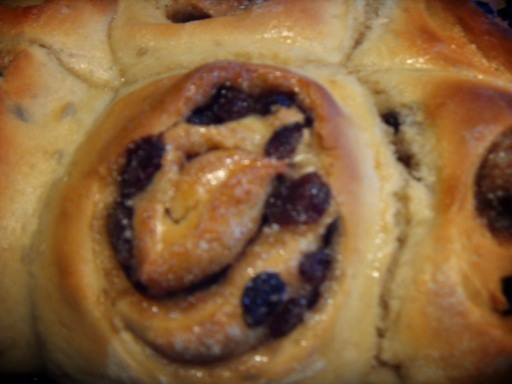 What You Need: 15g of yeast, 15 tablespoons of sugar, 1 tablespoon of salt, 2x 400g plain flour, 2 eggs, 5 tablespoons of oil, 3 tablespoon of mixed spice, 1 banana, 50g sultanas, 50g dried morello cherries. Firstly in a mixing bowl, dissolve the yeast and 7 tablespoons of sugar in warm water. Then add the salt and half of the flour, mix until well combined. After with a wooden spoon beat in the eggs and oil. Slowly add the remaining flour, until completely combined turning into a dough. On a floured surface knead until you have a smooth pliable dough. Transfer to a lightly oiled bowl and roll the dough around to coat in the oil. Cover with a damp cloth and prove in a warm place until it has expanded in size, around 35/40 minutes. Now prepare the filling, with the rest of the sugar, mix together with mixed spice (cinnamon, dried coriander seed, allspice, cloves and nutmeg). I have chosen to make three kinds, one with sultanas, the second with dried morello cherries and the third with banana. These look great. Thanks for checking out my blog. They look lovely. I may have to try making them, not sure about the banana though! Hopefully they will be a bit quicker than these choc ones: http://wp.me/pxmpF-ic but just as delicious. Next heard of anyone using banana in a bun but I’m willing to give it ago. Thanks for the recipe; I will give these a try tomorrow.